Sometimes breaking things down into pieces can provide a new perspective, though if you break them down into A Million Little Pieces, that perspective ends up being total bullsh*t. For pieced-together perspectives on Chi, check out Fisheye Vertigo. 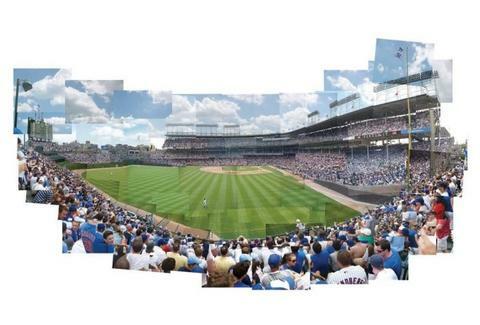 The painstaking project of a local photog, FV starts with hundreds of snapshots taken from a single spot covering every inch of familiar Chi scenes, allowing them to be reassembled into collages with remarkable continuity, so fans of Lost will hate them. The local sports scene is well-represented, from a panoramic, blue-skied view from the Wrigley bleachers to the "Air Toews" Blackhawks-clad Jordan statue from the Stanley Cup run, while other local landmarks include a full-blast Buckingham Fountain, and the Field Museum dinosaur across from Soldier Field, though thankfully someone eventually found Ms. McCaskey and led her back to the skybox. There's also a strong selection of non-Chi action, like the view from Israel's Golan Heights, a bustling intersection in the heart of Harvard Square, and a sweeping view of a crowded Phish show at Alpine Valley, which you shouldn't get for your pad if people are constantly Bouncing Around The Room. They also offer up collage services for personal subject matter such as pets or weddings, preserving a moment before your marriage breaks into a million little pieces, and becomes total bullsh*t.